By 1802, most members of the the Brotherton community had left for New Stockbridge. A number of Indian familes however, remained in New Jersey, including those living at their ancestral community of Weekping or Coaxen. Ownership of Weekping was so confused, that the State of New Jersey passed a law in March 1806 to manage the land on behalf of the Indians. The commissioners, Joseph Budd and Phineas Kirkbride were opponents of Josiah Foster. These commissioners worked in cooperation with the Indian's representatives, Enoch Evans and John Haines. In fact, Enoch Evans had previously been an Indian commissioer, but resigned from the post when the push was made to dissolve Brotherton in 1801. To the Honourabal the Legislative Council and General Assembly of the State of New Jersey Now Seting at Trenton. Chapter CXVIII. An Act appointing commissioners to take in charge the Coaxen lands in the county of Burlington. Sec. 1. BE IT ENACTED by the council and general assembly of this state, and it is hereby enacted by the authority of the same, That from and after the passing of this act, it shall be lawful for Joseph Budd esquire, and Phineas Kirkbride, and they are hereby authorized and appointed to take and receive the possession of all the Coaxen lands of which the said Indians are at present in possession, and to put out the same on improving leases or otherwise at the discretion of the aforementioned commissioners; Provided nevertheless, that nothing in this act shall be construed so as to invalidate or in anywise affect the title, claim or demand of any person whatever, claiming title to, or interest in the said Coaxen lands, or any part thereof. Sec. 2. And be it enacted, That it shall be lawful for the said commissioners and their successors in office, to commence and prosecute all actions or suits of law for the recovery of any debt or debts due, and owing from any person or persons, to any or either of said Indians, or for any trespass committed on the said lands, or any part thereof. Sec. 3. And be it enacted, That the leases or grants which shall hereafter be made by any of the said Coaxen indians, to any person or persons whatever, without the consent of the aforesaid commissioners, shall be null and void. Sec. 4. And be it enacted, That the said commissioners and their successors in office, shall render under oath, a just and fair account of all their proceedings, to the judges of the inferior court of common pleas, for the county of Burlington, in the term of May, yearly, and every year; and it shall be the duty of the said court to inspect, and if approved of by them, to allow said accounts, and also after allowing a reasonable compensation to said commissioners for their trouble, to order the appropriation of the remainder, if any there be, in such manner as they may think most proper, for the use and benefit of the said indians. Sec. 5. And be it enacted, That if any of the said commissioners should die or refuse to serve, then it shall be the duty of the court aforesaid to appoint a person or persons to fill every such vacancy. Passed at Trenton March 13, 1806. 1808 Abstract: John Pettit, the unlawful tenant referred to above, was removed. Of the $53.33 received in rent, $29.36 was paid to Barshaba Mulles. 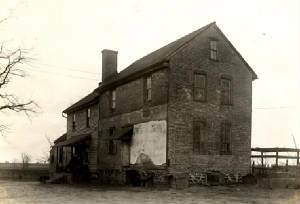 1809 Abstract: The dwelling house was moved to the fork of the road (site of the Wm. Irick house?). A cellar was dug and a stone wall put under the house. Of the annual rent, $42.33 was paid to the Indians. 1810 Abstract: Reiteration of similar information about rails, improvements, etc. The house mentioned in the 1809 report is described as being at the forks of the New road. Amount paid to Barshaba Mulles, $42.33 (the commissioners only took $11. for their services for the preceeding two years). 1811 Abstract: The Ridgway lease expired and there was a dispute as to the value of improvements made to the property. The dispute was taken to court and a jury awarded Ridgway $14.36 for the value of the improvements (taken from the annual rent). 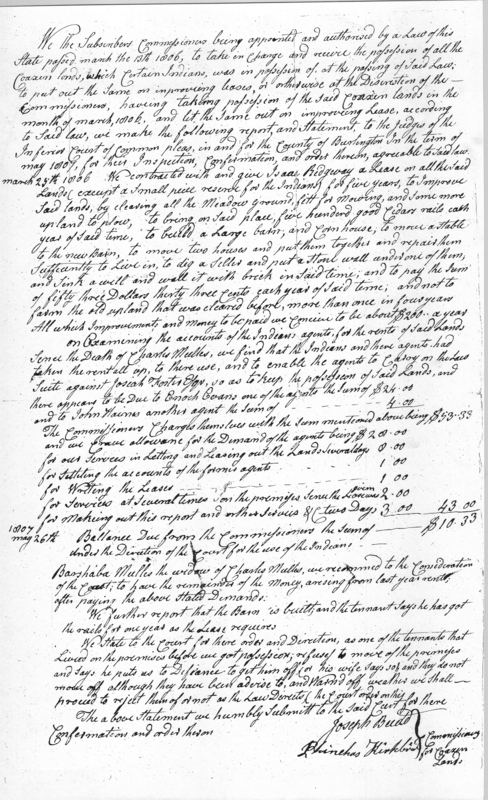 A new lease was executed with Robert Baxter for an annual rent of $66.67 plus monies made by the sale of wood. The new lease reserves a house for Barshaba Mulles on the property. Of the annual rent of $53.33, $23.50 was paid to Barshaba. 1812 Abstract: Baxter's lease is for four years. Of the $66.67 in rent, $55.67 was paid to Barshaba. 1813 Abstract: A thorough review of all the income and expenses of the Coaxen land was presented and adjustments made accordingly. Of the adjusted rent of $43.82, $32.82 went to the Indians. 1814: No report filed; see 1815 for reason. 1815 Abstract: Further adjustments to expenses were made and in 1814, only .25 cents was paid to the Indians. In the interim, Barshaba Mulles died, and her coffin and grave expenses were paid by the commissioners. The total balance due to the Indians was $24.90, but the commissioners did not know who to pay the sum to. "I not knowing who the nearest relation is to the Mulles family, I must leave it with the court who the balance must be paid to," stated Joseph Budd. Phineas Kirkbride, his fellow commissioner, had also died in the interim. The court was asked to appoint a new commissioner. 1816 Abstract: Baxter's original lease expired and a one year lease was signed with him for a total value of $250, which included rent and improvements. After expenses were deducted, $72.90 was paid to the Indians as the court directed. [no mention of Indian recipient] New commissioner was Asa Eayre (of Eayrestown, just east of Fostertown in Burlington County). 1817 Abstract: Baxter's lease expired and a new lease with Clayton Joyce was signed. The rent was $200 in money or in building a house or a small room (for Indian use?). Of rent received, $94.90 was paid to Nancy West, the nearest relation to Barshaba Mulles. West wished that a small home be built on the property, and a small amount paid to her for her support. 1818 Abstract: Clayton Joyce paid $50 in money and $150 in improvements. Nancy West had received $15 each year in support. A total of $118.90 was due the Indians. Joseph Budd Asa Eayre} commissioners"
1819 Abstract: Clayton Joyce's value of improvements exceeded the rent that he owed, and a credit was given to him. In addition, "as Josiah Foster had rejected him off of said Lands, he has not Done any improvements thereon since, but Expect to fulfill his Lease, by bringing on cedar Rails all in a short time and pay all his rent although the Ejectment has been brought to take the Land from the Indians - where he Lives"
"As the order of the court Last may term premitted us to take the money to carry on the Law suit in support of the Indians claim against Josiah Foster, and as the Law suit is not desided, we must ask of the court that the same order that was granted to us Last year to take the Ballance to carry on the Lawsuit may be Extended this year. May the 25th 1819 Joseph Budd Asa Eayre} commissioners"
End of Commissioner reports as the law suit was decided in Foster's favor in the federal court sitting in New York. 1807 Coaxen Commissioner Report given in full above. Joseph Budd house, ca. 1750. Southampton Twp.